Soft rubber colored tip stylus helps protect your screen from smudges and increases sensitivity. Fun color matching rubber tip makes this stylus stand out from the rest! Pack of three to share with your friends and/or family! Clip designed to store easily in a pocket, book, or wallet. 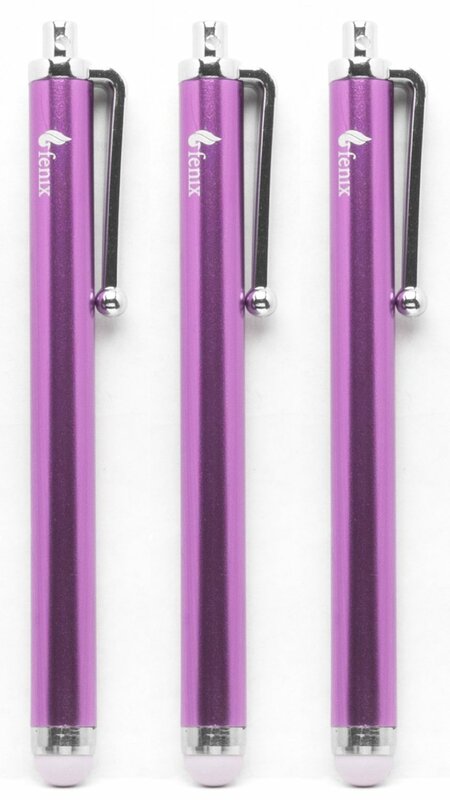 These Fenix styluses are durable, soft rubber colored tipped and the clip comes in handy for storing in your pocket, wallet or even in a book! 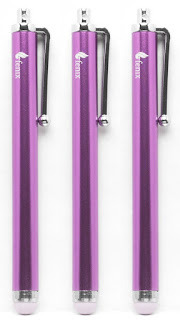 I was happy to get this Pack of Three Universal Stylus Pen with Matching Soft Rubber Tip. I got the blue set, which is the same color as my tablet, so it looks great! I love that these come in a set of 3. One is never enough, I always end up searching for it. Having 3 is great for me so I always have one on hand. I like that it has a clasp to attach it to my tablet case. It fits nicely and it tucked away so it does not get pulled off by accident. I did end up giving 1 to our little girls, they like to use it when typing on their tablet. I like that they use this stylus because it helps them with hand eye coordination as well as keeping the screen much cleaner from sticky kid fingers. This set of stylus is made well and I especially like the firmness of the soft rubber tip, it is not too hard and not too squishy. I like that they come in many different colors to suit everyone's individual style and can match their devices! I recommend it!